I've learned two things out of my immense love for food, one being to always be open to new ideas and two when a chef is giving you tips, listen well and write fast! Catalina OP has become like the Disneyland of seafood for me, because every time I go there I learn new things, discover new food and meet amazing fellow foodies. This time Chef Ken Gardon aka the "Man With a Pan" who modestly says "Ken's fine, Chefs are people with TV shows" gave me a quick lesson on cooking fish and making an epic glaze. While waiting for my 5lb Cod to be wrapped up, I expressed a love for this Japanese Miso Glazed Cod that I always order and with that love, my woes that for $13 I wished I got more than a 3oz serving. The master "Man With a Pan" immediately said "write this down" and gave me the ingredients to make a Miso glaze. Alternating conversations between the Cod and the Salmon being cooked, I finally wrote down a grocery list and some steps. Fast forward a couple evenings, after steaming the head and letting the body marinade.. 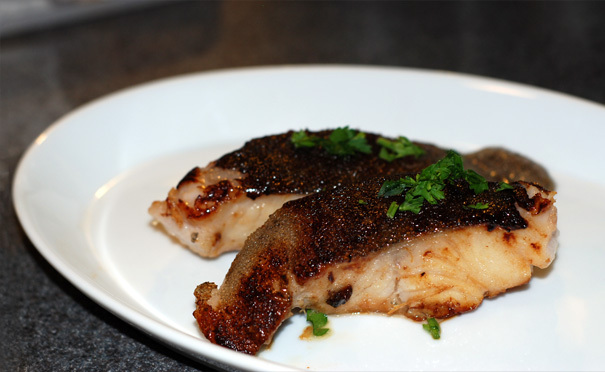 I am now having this INCREDIBLE glazed cod for dinner! Catalina OP is always cooking up something and you can stop in to try out the seafood that's there for sale.